Kennebunkport Paints the Town Red – February Events! 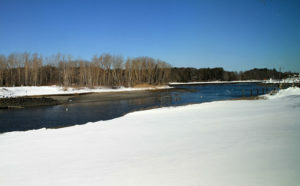 Kennebunkport Maine is a lovely seaside town to visit in all seasons. But there is something magical about this coastal Mane village around Valentines. 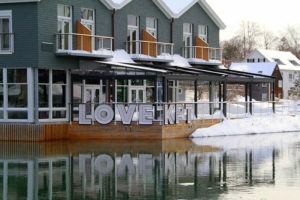 Kennebunkport gets all decked out for February, as locals Paint the Town Red … you should come with your special someone… February is for Lovers in Kennebunkport and Kennebunk Maine! See why Kennebunkport is New England’s most romantic town. 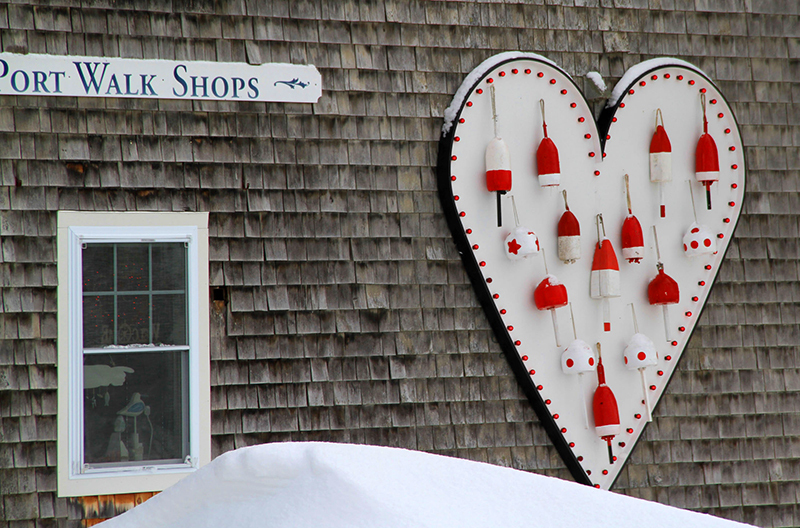 Kennebunk and Kennebunkport innkeepers, restaurateurs and shop owners “Paint The Town Red” in February with sparkling red and white lights, heart shaped everything, red plates specials, and romantic lodging deals with Champagne, chocolates, spa treatments and lavish breakfasts. Feb 9 Old Vines Cocktail Class 1-3pm, learn from the best bartenders about cocktail crafting, get behind the bar, enjoy concocting and sipping drinks, snacks too. Tickets $60, Old Vines Wine Bar . Feb 9 Couples Paint 3-5 p.m. at Make It KPT, $59 per couple includes painiting supplies and two canvases for your creativity, take away your keepsake. Feb 9 Earth at Hidden Pond Winter Wine Dinner at Ocean – Cape Arundel Inn, 6-9pm $135 for a 3-course menu with wine-pairings by Earth’s chefs. Feb 14 Alisson’s Valentine’s Giving Tree 5-9pm, pick a red envelope off the Tree and get a gift ranging from $1 to dessert, to $100 and everything in between at Alisson’s. Feb 16 Old Vines Cocktail Class 1-3pm, learn from the best bartenders about cocktail crafting, get behind the bar, enjoy concocting and sipping drinks, snacks too. Feb 16 Tickets $60, Old Vines Wine Bar . Feb 16 Chocolate Torte Cooking Class at Stripers 2-4pm, learn to make delsicous dessert while sipping wine and snakcs, $25 per person. Feb 16 Couples Paint 3-5 p.m. at Make It KPT, $59 per couple includes painiting supplies and two canvases for your creativity, take away your keepsake. Feb 16 Sushi Making Demo at The Boathouse 4-6pm $50. Feb 22 WINTER WARMERS 2-4 p.m at Batson River Brewing & Distilling, $25 for to learn to make several cocktails and enjoy bites in Kennebunkport’s cool brewing room. Feb 23 Avalanche Party at Old Vines Wine Bar 6-11pm, Kennebunks’ biggest annual winter party! All you can eat buffet, dueling pianos, outdoor ice bar, wine, beer, specialty cocktails, and live music, plus a late night dance party. 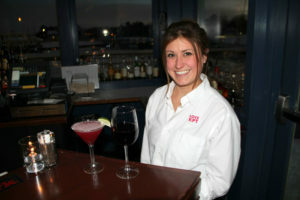 February at Stripers at Breakwater Inn has a Sunset Menu, $15 – 3 course menu Wed-Sunday 4-6pm. Also enjoy Happy Hour at Stripers daily 3-6 $5 beer & $4 wine and beautiful sunsets. Maine Art – 25% off custom framing all month long. February hours 10am-5pm Thursday through Monday. Tag your photos socially with #LoveKPT – get a selfie on the Bridge by the big red heart, or at Kennebunkport Inn’s igloos! For lodging in The Kennebunks in winter, see our Kennebunkport Lodging Guide. Also see our Kennebunkport Events Page for all the goings on all year long in the Kennebunks. We love to hear that Kathleen! Leave a Reply to "Kathleen Marshack"